Some states can fine electors who fail to stick by their pledge and vote for the party’s nominee, but not in Missouri. Steve Walsh with west-central Missouri Republican Congresswoman Vicky Hartzler’s office says “faithless” electors are rare. 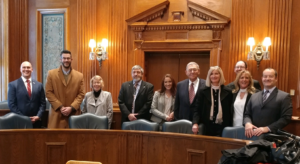 All ten of Missouri’s electors helped Republican Donald Trump secure enough votes at this week’s Electoral College meeting, despite protestors hoping to change the minds of electors. Walsh is not sure if any Missouri electors have ever voted against the nominee. Seven so-called faithless electors were a part of this week’s Electoral College voting – the most since 1972. According to the National Conference of State Legislatures, there is no federal law or constitutional provision requiring electors to vote for the party that nominated them. Thirty states have laws that attempt to bind the votes of presidential electors. Some have laws that require their electors to vote as pledged. These laws could either include a fine on an elector who fails to vote according to the statewide or district popular vote, or could disqualify an elector who violates his or her pledge and provide a replacement elector. The NCSL says no elector has ever been penalized or replaced – nor have these laws been fully vetted by the courts. Oklahoma and Washington can fine a “faithless” elector $1,000. In North Carolina, the fine is $500, the elector is deemed to have resigned and a replacement is appointed. In South Carolina, an elector who violates his or her pledge is subject to criminal penalties. In New Mexico, a violation is a 4th degree felony. One of Missouri’s electors chosen did not vote during this week’s meeting. The other nine electors picked a replacement. Congress must certify the Electoral College votes during the first week of January.